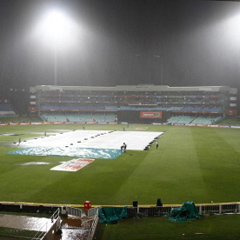 Durban - Rain spelt the end of the Kolkata Knight Rider’s Champions League Twenty20 semi-final hopes after their match against the Perth Scorchers ended in a no-result at Kingsmead on Wednesday. The Scorchers were on 91 for two after 14 overs before heavy rain halted play. Both teams had to settle for two points apiece which means that Kolkata have just two points from three matches after losing their first two games.